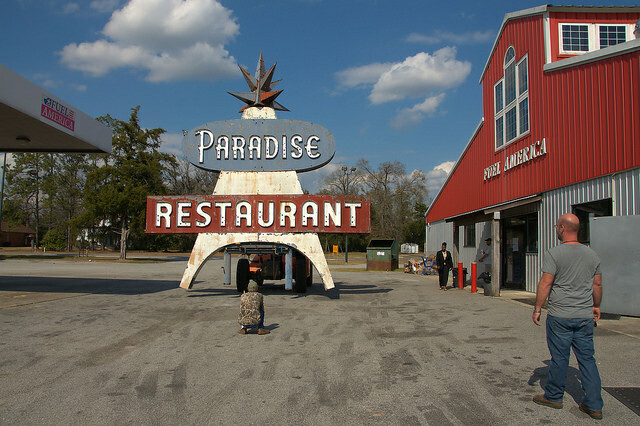 Like many other photographers and travelers on US 301, I’ve shot the iconic Paradise Restaurant sign numerous times over the years. 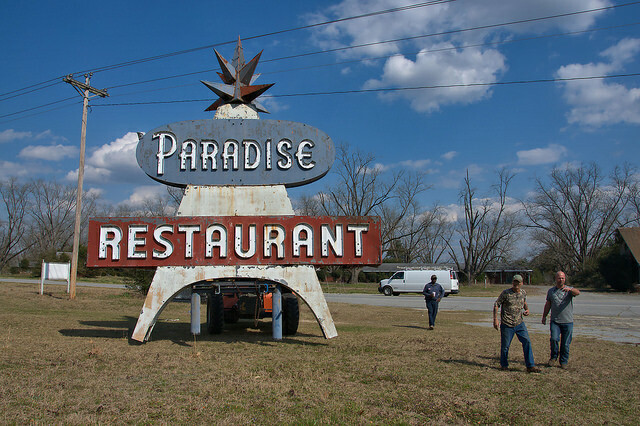 It’s a landmark that most who have ever driven past remember. 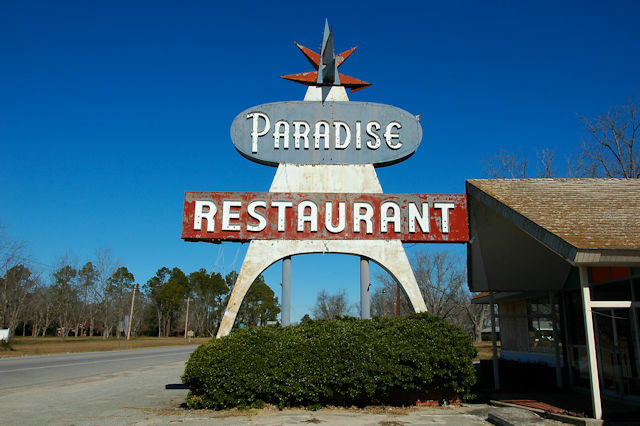 By researching postcards of the restaurant I’ve discovered that a smaller sign preceded this one and was still in use until at least the early 1960s. I’m not sure when this sign was placed, but my guess would be sometime in the 1960s. 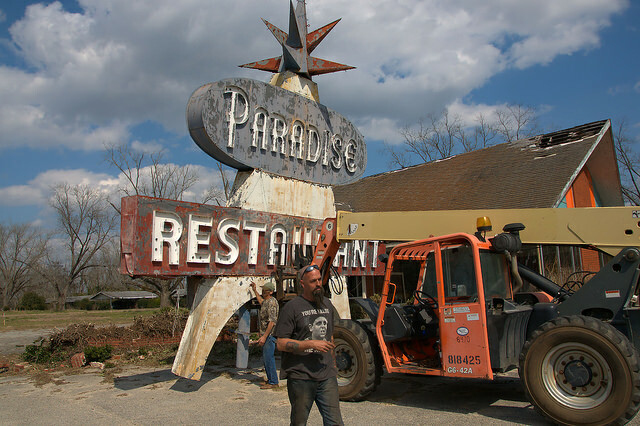 A comment from Jerry Levy on a previous post about the sign indicates that the restaurant was open as late as 1982. 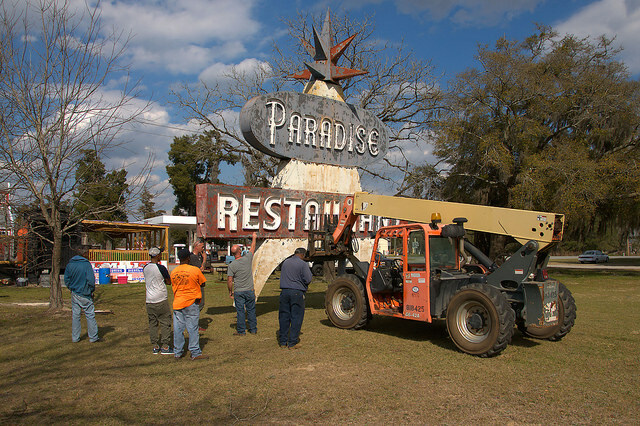 I recently got a message from Melissa Birmingham stating that the sign would be removed and relocated to the business that she and her husband Greg operate across the highway, the Cooperville Caboose restaurant. I was sad to hear that it would be removed but less so after talking to Melissa. 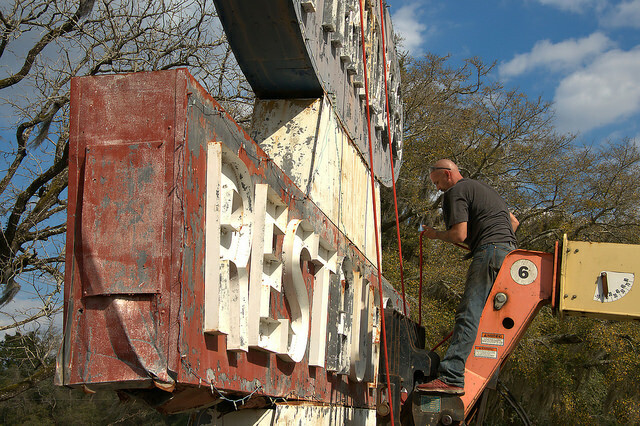 She invited me to come up and document the removal of the sign. Dollar General bought the property on the corner that includes the historic sign and their plans were to scrap it. 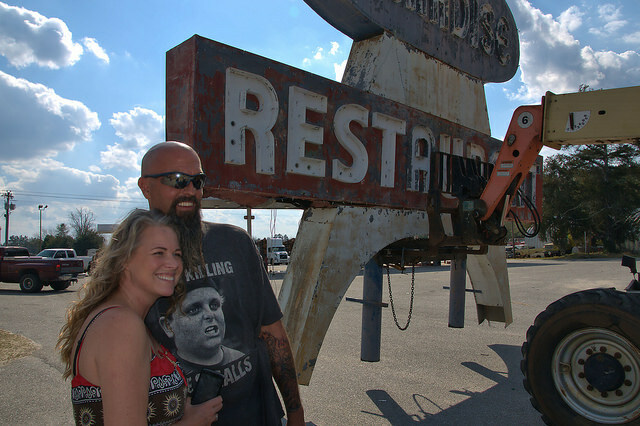 Melissa and Greg knew that the loss of the sign would be a blow to the community and saving it isn’t a publicity stunt. 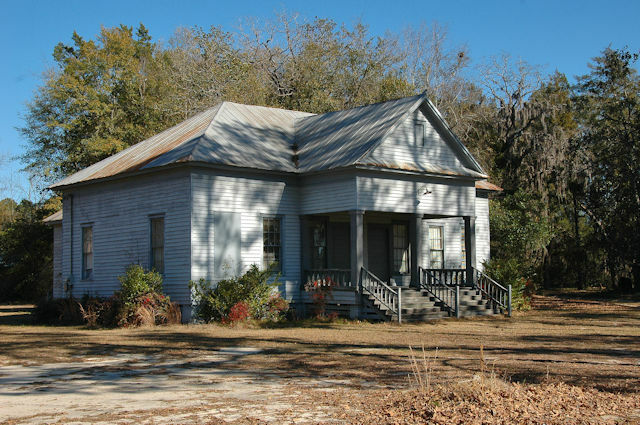 It’s where preservation and community involvement come together for good results. 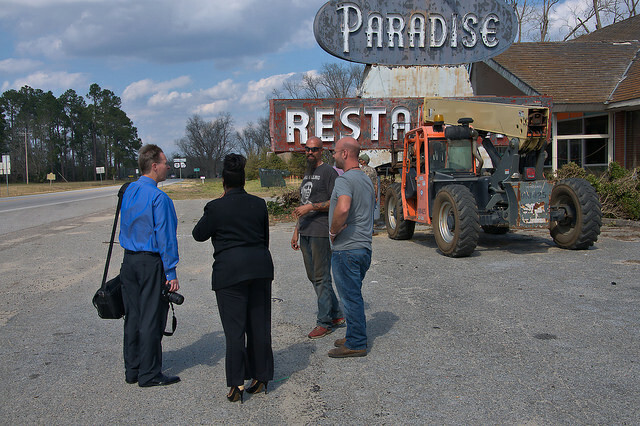 The Sylvania Telephone (newspaper) and Screven County Chamber of Commerce were present to witness the event. 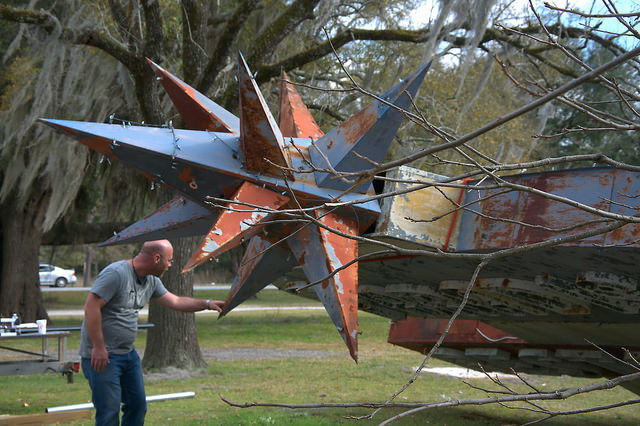 Greg made getting the sign across US 301 look easy. It made its way through the trees behind the post office. Melissa & Greg took a break and posed for a photo. One of my favorite shots was seeing it pass through the parking lot of Fuel America. This is where it will rest until it’s refurbished and raised at the Birmingham’s business, Cooperville Caboose. 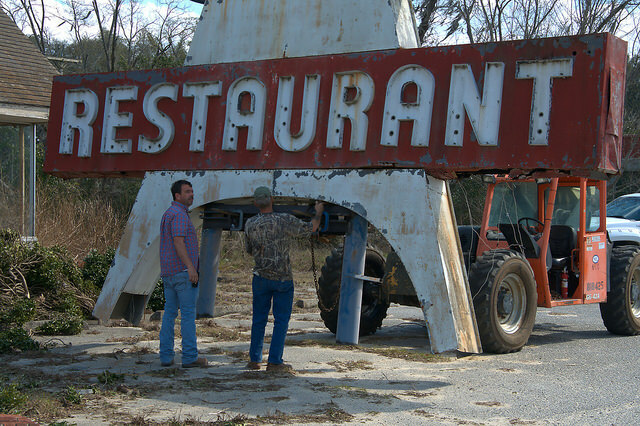 The sign is hollow and rusty so lowering it was a bit tricky. 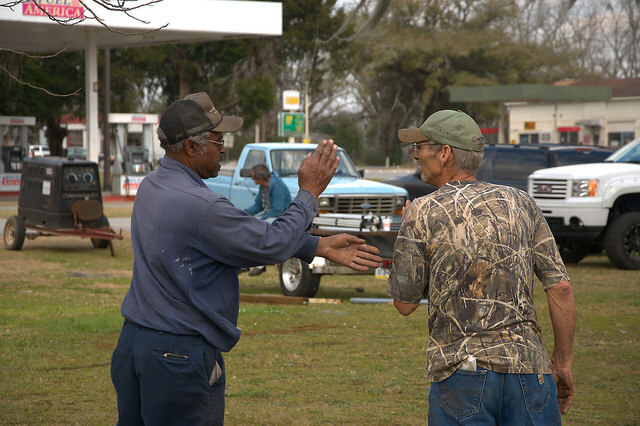 With help from volunteers and well-wishers, the move was successful. The spinning star that tops the sign actually turns. 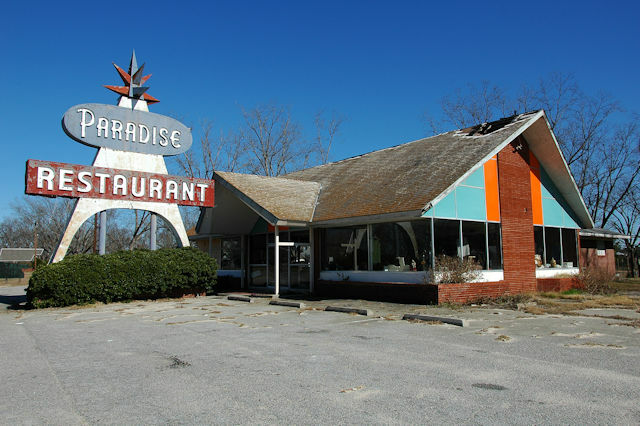 The old Paradise Restaurant and adjoining motel were among numerous businesses that took advantage of the busy automobile traffic on U. S. Highway 301, a primary route for tourists along the Atlantic seaboard in the days before interstates. 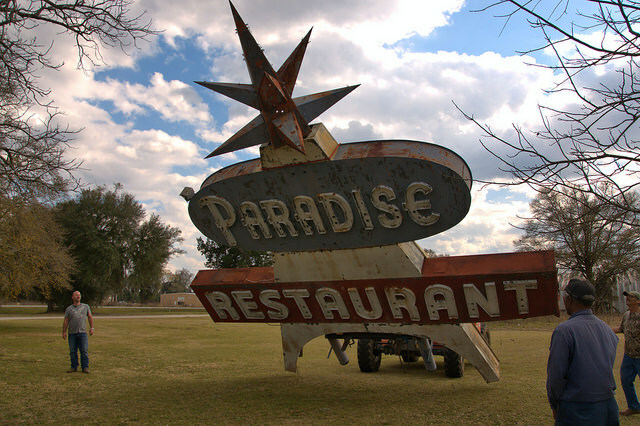 The present sign was erected in 1956 but the restaurant and adjacent hotel were built a bit earlier. 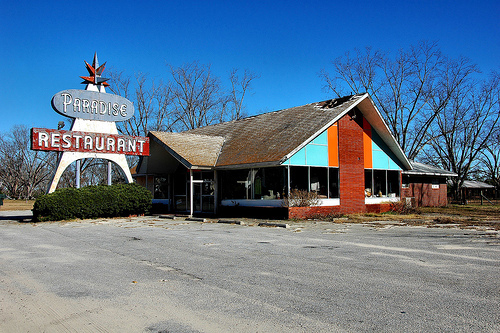 [I thought it was a Howard Johnson’s per the color scheme, but Dale Reddick notes that it was not affiliated with that chain]. 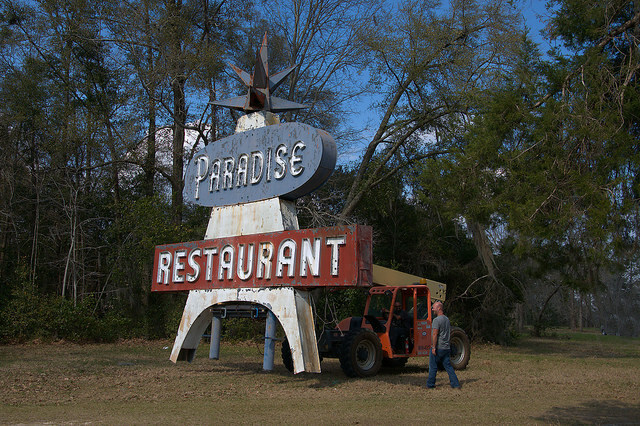 This sign was among the most-photographed landmarks on US 301 in Georgia; in 2016 the property was razed but the signed saved for use at a restaurant across the highway. 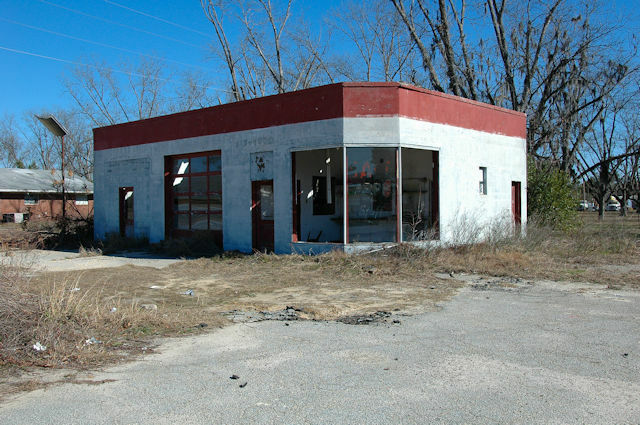 This was demolished in 2016. 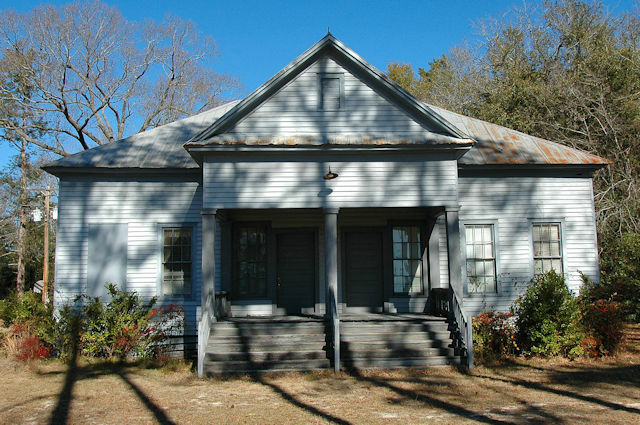 This now serves as the local community house.